Position a rack in the lower third of the oven and preheat the oven to 375˚F/190˚C. Line the cake pan with a circle of parchment paper. Place the chocolate and butter in a medium heatproof bowl in a wide skillet of barely simmering water. Stir occasionally until nearly melted. Remove from the heat and stir until melted and smooth. Or microwave on Medium (50%) power for about 2 minutes, then stir until completely melted and smooth. Stir in the brandy, almond extract, if using, and salt. Set aside. Meanwhile, pulse the nuts and flour in a food processor until mixture has the texture of cornmeal. Set aside. In a large bowl, whisk egg yolks with ½ cup of the sugar until well blended. Stir in the chocolate mixture. Set aside. In a clean dry bowl, with an electric mixer, beat the egg whites and cream of tartar at medium speed until soft peaks form when the beaters are lifted. Gradually sprinkle in the remaining ¼ cup sugar and beat at high speed (or medium-high speed in a heavy-duty mixer) until the peaks are stiff but not dry. Scoop ¼ of the egg whites and all of the nut mixture on top of the chocolate batter, and, using a large rubber spatula, fold them in. Scrape the remaining egg whites onto the batter and fold together. Turn the batter into the prepared pan, spreading it level if necessary. Bake for 25 to 30 minutes, or until a toothpick inserted about 1-½ inches from the edge emerges almost clean but a toothpick inserted in the center is still moist and gooey. Set the pan on a rack to cool. 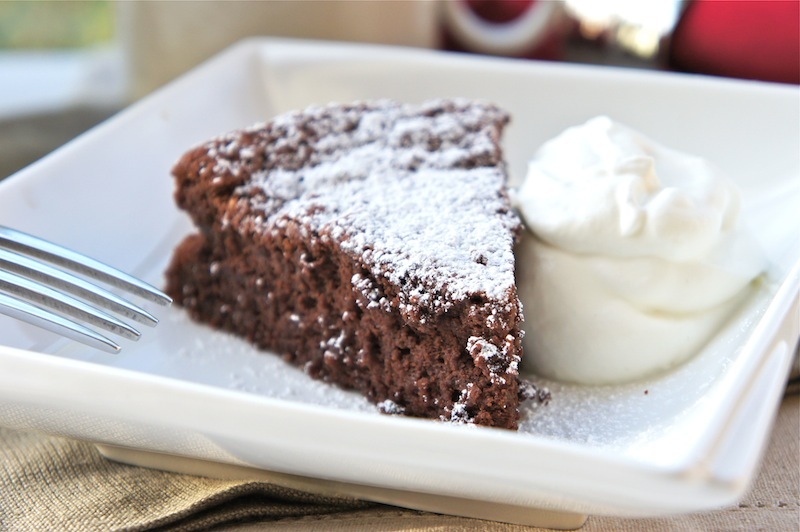 (The cooled torte can be covered tightly with plastic wrap, or removed from the pan and wrapped well, and stored at room temperature up to 3 days of frozen for up to 3 months. To serve, slide a slim knife around the inside of the pan to loosen the cake. Remove the pan sides and transfer the cake, on the pan bottom, to a platter, or invert the cake onto a rack or tray, remove the paper liner, and invert onto a platter. 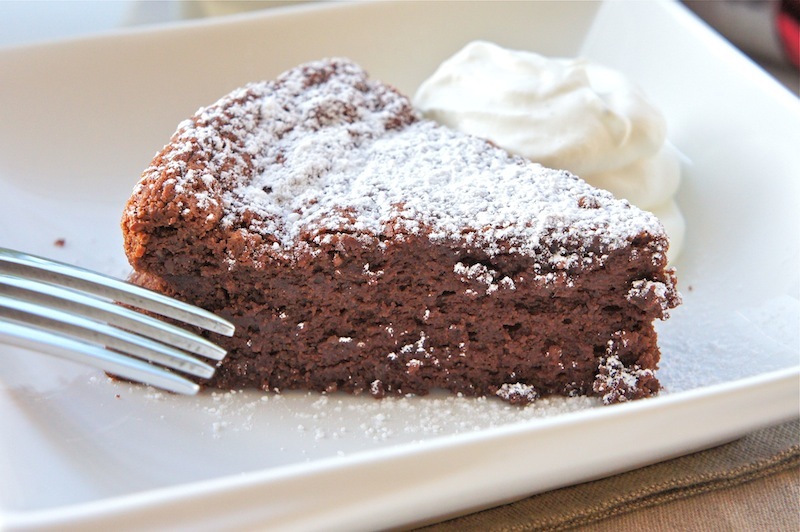 Using a fine-mesh sieve, sift a little powdered sugar over the top of the cake before serving, if desired. Serve each slice with a little whipped cream. Oh this looks so good. I can't wait to try it. This looks delicious! I want a big slice right now! I somehow decided when I was 15 to make Julia Child's Reine de Saba. May I say, yours looks a heck of a lot better. ;-) Congrats on a well-deserved Top 9! Looks moist and delicious and I love all the ingredients. I'll have to try it, thanks for sharing the recipe. I have never heard of this dessert but judging by the ingredients and picture, it sounds delicious! Oh my goodness - this cake is calling to me - it looks divine! What an elegant cake/dessert type thing! I have never heard of this. IT looks wonderful. @Leah (So, How's It Taste? ): Yes, they were great! @Goodfoodcanada :Thanks. Let me know how it turned out. I'm the queen, and this is MINE !! nobody touches it !!! !